We spend countless hours obsessing over the minutiae of our appearance, only to have our hard work and diligence undone by simple, unattractive (or worse) habits. A recent episode of the Dr. Oz show picked a "Top 8" list of bad habits for our immediate attention. How many of these nasty habits do you have? A natural outgrowth of thumb-sucking, many people bite their nails as a nervous or idle habit. Not only does this wreck your manicure, have you thought about where those fingers have been? All the germs you can touch, pushed directly into your mouth. Yuck! Avoid the bloody cuticles and keep those germs at arm's length. Pick up a pack of chewing gum (sugar-free, of course) if you need something in your mouth! Is your complexion a bit too pasty for your tastes? The tanning bed or that recliner beside the pool really isn't the best answer. The same sunlight (real or artificial) that turns your skin bronze is also disturbing your skin's genetic makeup and piling on the wrinkles. If you can't handle the pale, check out some bronzer or spray-on tan. You'll thank yourself in your golden years. What? The Tonight Show is a nasty habit? Only if you want a good night's sleep. TV in general is designed to keep you energized and attentive to those lovely commercials. Further, the blue glow coming from that massive flat-screen can really confuse your body clock. Invest in a DVR and spend your late nights with a good novel. You can catch up on Jimmy Fallon tomorrow after work. Nobody likes pimples, but sometimes benign neglect is the best approach. Go ahead and treat those pimples with topical creams and good hygiene, but resist the urge to pop'em. That can push bacteria deep into your tissues and lead to long-term problems. Trust us, those pimples are only huge in your mirror. We really don't notice them! Sure, those drive-throughs delivering bags of burgers and fries are convenient. But with a bit more planning and time, though, your diet can be dramatically healthier. So drive past those arches and consider packing a salad. Your cholesterol levels will improve before you know it. Admit it, you take your smart phone into the bathroom. Playing the latest fad game while taking care of business may seem like valid multitasking, but ugghh! The germs that you will carry on that beautiful glass screen will take days to rub off (onto your fingers, you know) and the possible damage to your backside because of extended time on the potty... is it really worth it? I think not. We all remember the excitement of turning 21. Oh, and that painful next morning. Yet we sometimes yearn to go back to that golden moment and try to recreate that magical (and only dimly-remembered) night. The problem is that these nights of alcohol-fueled excitement really take a toll on our bodies. Your liver can't handle the abuse, so maybe switch to water after that second cocktail? Does anyone really promote smoking any more? Without question, this is one of the most destructive nasty habits that still exists in our polite society. 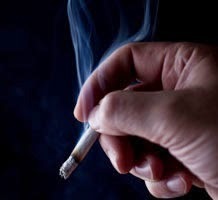 If you are still a nicotine addict, check out hypnosis, nicotine patches, or therapy. There are a lot of tools to break your addiction and we'd really love to have you around longer. So what is your score? How many of these habits should be on your "Break" list in the new year? Have a good strategy for changing any of these nasties? Leave us a comment and share the wealth!